Information and specifications on the Shoprider GK-8 Chameleon. Come in to Mobility Store in Nanaimo to see more. Shoprider’s GK84 Chameleon is a super-lightweight four wheel scooter, easily taken apart for loading into a car. 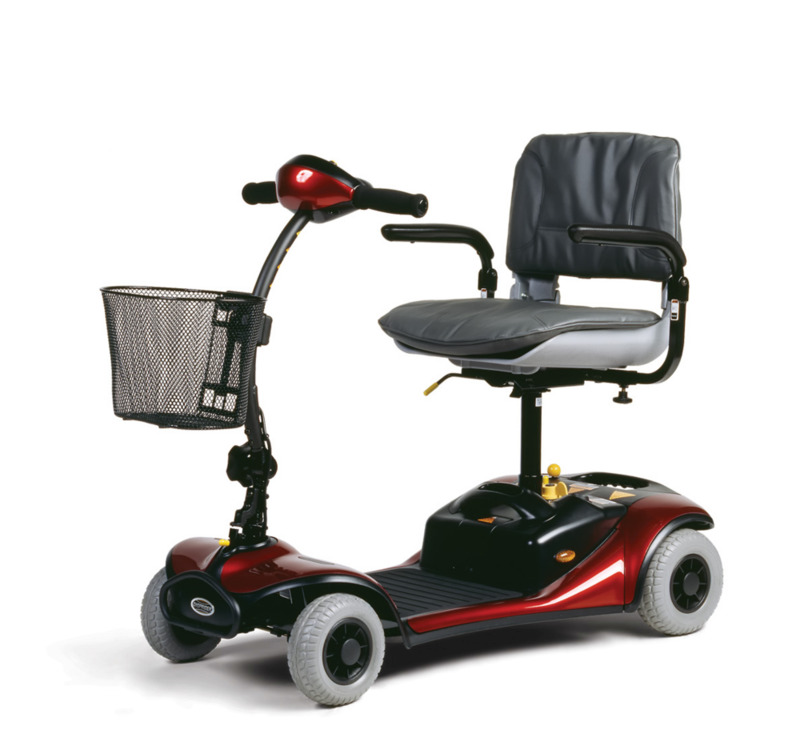 It’s a great choice for use indoors, for short trips outdoors, and for people who want a scooter that can travel – on aircraft, by rail or cruise ship! The tiller has a large illuminated battery gauge to warn you against getting caught without adequate charge. It features the key switch, maximum speed knob and horn button, with the throttle control underneath. The lightweight seat has a folding back and width-adjustable armrests. The arm rests fold up out the way and the whole seat swivels for easy access. Several of the component parts have large easy-to-grip handles for ease of loading into a vehicle. The basket can be lifted off and the tiller quickly folded down. The steering is easily locked to stop the wheels turning when loading the scooter. The battery can be charged on the scooter, or easily carried off to charge at a convenient 110 v. socket. No flats ever - the wheels are foam-filled. Why is it called Chameleon? Because each scooter comes with three brilliant-coloured sets of body panels that you can change in seconds, at a whim!